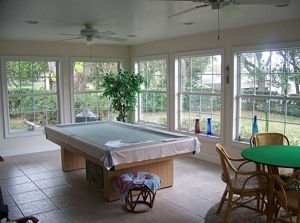 Purcell Construction builds sunroom additions to many homes in the Lakeland area. Your home will have a seamless appearance once the addition is complete. We provide a design/build service with each project we do. You give us the concept and we will design it and build it to your satisfaction. Here in the Sunshine State of Florida, sun rooms are a great way to enjoy the delightful rays of the sun, especially in the winter months when it is bitter cold up north. We can enclose an existing screen porch, or build a sun room as an addition to your home. This is an effective way to add valuable living area to your home, while adding beauty and comfort to your Florida home. Exterior appearance is important to any room addition. Your new sunroom will blend perfectly with whatever existing wall and roof design you have to give a seamless appearance to the finished product. Windows used in your new sunroom will be vinyl or aluminum frames w/insulated low E2 glass to reduce the heat and cold transfer through the glass. This is also a good time to consider replacement windows for your home. Call us now to schedule an appointment.